Construction Ambiances II is just over 2,4 Gb of loud and lively recordings of modern construction sites, a total of 78 minutes/31 files, all in 24bit/96kHz quality. 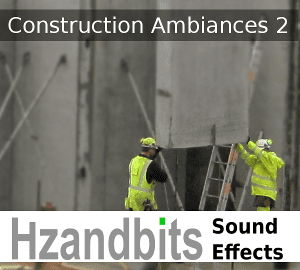 Just like Construction Ambiances, this sound effects collection is stuffed with clean, ambient recordings of excavators, trucks, cranes, pile-drivers, drilling concrete, cutting re-bar, shoveling rubble, etc, etc. Recorded in Denmark, but with intelligible Danish words edited out, so should be very clean. Many individual sounds are over 3 minutes in length and recorded from more than one perspective, giving you more flexibility in your productions. Construction Ambiances and Construction Ambiances II contain sounds from the same locations and sessions, which makes them perfect together – but each can be used on it’s own as well. Gear Used: Recorder: Sony PCM M10. Mixer/pream: SQN 4S Series II. Microphones: Sennheiser MKH60/30.